By Gloria Garland L.Ac, Dipl. Ac. & CH. Jenner is a twenty-plus-year-old quarter horse gelding diagnosed with head shaking syndrome. His veterinarian, who had ruled out possible medical and mechanical explanations for his head flipping behavior referred him for treatment. Jenner’s symptoms consisted of continual vertical head tossing both at rest in his corral and while being ridden. This behavior occurred only during the daylight hours and appeared worse on windy days. His head tossing lessened in the shade and he was symptom free at night. In an effort to keep him comfortable his owners used a fly mask and moved his feeder into the shade. His owners had become frustrated and trial riding had become hazardous. The once stable, easygoing Jenner tripped and stumbled and his continual head tossing threatened to bloody noses. Head Shaking Syndrome is a group of symptoms generally recognized by the veterinary medical experts. There is no definitive lab test for head shaking but some of the possible causes include tooth pain, middle ear disorders, allergies, nasal disease, guttural pouch infections, cranial nerve disorders and eye disorders. Symptoms can be brought on by changes in temperature, season, light or environment. Because Jenner’s symptoms appeared worse in the daylight and better in darkness and shade, I treated him as a photosensitive head shaker. Photosensitive head shaking is caused by exposure to light or wind. In this situation, light over stimulates the eye, which causes over stimulation to the ophthalmic branch of the Trigeminal Nerve. The face, cheeks and nasal cavity are enervated by the Trigeminal Nerve. In humans this painful condition is known as Trigeminal Neuralgia. Patients describe the pain as a crawling, burning, searing or a twitching, electrical sensation. The sensation can be so painful and unrelenting that people have attempted suicide. It’s no wonder that the head flipping behavior of an afflicted horse can become violent even to the point of self-mutilation. Neuralgia or nerve pain is referred to as wind pain in Traditional Chinese Medicine (TCM) terms. Imagine the leaves of a tree trembling and shaking on a windy day. The ancient observers of this natural phenomenon viewed tremors, twitching, and spasms as wind-like in their physical manifestations. For many photosensitive head shakers, like Jenner, symptoms worsen on windy days. To treat the symptoms of Jenner’s wind-like, nerve pain I designed a custom herbal formula with the goal of reducing his sensitivity to light and lessening the nerve pain. The powdered formula consisted of several Chinese herbs designed to “calm wind” including: Fang feng (Guard Against Wind), Ding feng cao (Settle the Wind) and Gu teng (Hook Vine). In addition, I gave Jenner an initial acupuncture treatment and then instructed his owners in a follow up acupressure treatment plan using a laser pointer to stimulate acupuncture points. Treatment focused on two acupuncture meridians or channels: Stomach and Large Intestine. These two channels influence the area most affected by Jenner’s condition. 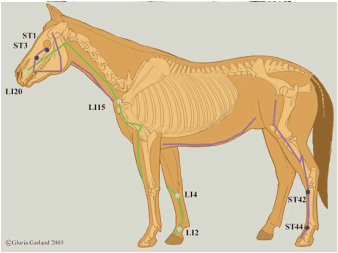 The Stomach Channel runs the length of the horse from the hind leg to nose. The upper end of the Stomach Channel transverses the eyes, face, cheeks and lips. Its partner, the Large Intestine Channel runs from the inner front leg over the chest up the outside of the neck to the cheeks and jaw and then joins the stomach channel on the outside of the nose. Two types of points, local and distal, were chosen. Local points treat regional facial symptoms. Distal (distant) points are used because of their ability to treat conditions on the far end of the channel--in this case, the face. “When the disease is above select points from below,” is a classical TCM treatment concept. This statement emphasizes the strong action that distal points offer in treating disorders at the opposite end of the channel. Acupressure treatment for photosensitive head shaking Local points ST 1 - Treats any pain on the stomach channel and photosensitivity. ST3 – Used for local pain and influences the Trigeminal Nerve. LI20 - Treats facial pain of any type, reduces wind pain in the channel and is the meeting point for the Stomach and Large Intestine Channels. Distal points ST42 - opens channel, reduces pain ST 44 – Clears the upper end of the channel (face) and treats disorders in the head, face, eyes or nose. LI2 - Clears wind from the upper end of the channel (face) LI4 - Expels wind, activates the channel. LI4 is the single most important point for treating disorders of the face and sensory organs. LI15 - Treats all wind pain. Jenner’s family fed him his custom herb formula daily as directed and performed the laser acupressure treatments regularly. On follow up six weeks later, Jenner’s veterinarian reported that he was symptom free.